Forest gardens are good for large or small gardens and various community spaces, either as a small area within the space or for the whole of the area. What makes a forest garden a forest garden is that it has layers of vegetation, often three but sometimes more, the plants are grown in drifts or mixtures and in general the soil is not disturbed. This form of growth is like that seen in natural woodland – hence the name. A forest garden grows in a way similar to that which is natural for the land and climate of the area and as a result it isn’t fighting against nature so is less work to manage and has a more natural feel. There are numerous perennial and self seeding edible plants that can be grown in this way but I feel that a forest garden doesn’t have to be edible, it can just contain flowers if you wish. Many good mixed borders are like forest gardens resulting in a build up of organic matter in the soil and little soil disturbance and hence the trapping of carbon. Forest gardening has many similarities to wildlife gardening in that it has a high diversity of structure, plants and light/shade with little soil disturbance. Growing a forest garden as part of your garden will increase the wildlife and diversity which will reduce pests and diseases; in addition the products will compliment the standard annual vegetables you may grow both in timings and taste. From the aesthetic point of view it will add structure and interest to the landscape. 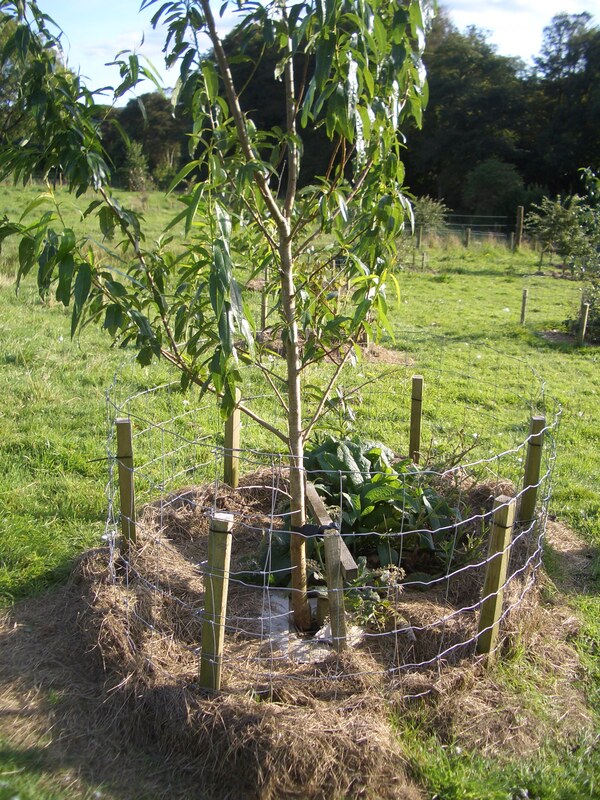 A well mulched tree with comfrey planted nearby to act as a dynamic accumulator. The plants of a forest garden will include things like fruit and nut trees, berry bushes, leafy greens, herbs and a variety of flowers and unusual edible plants. Within this mix some annuals can be planted with little soil disturbance. Forest gardening is about following the ways of the woodland ecosystem in general but this does not mean that it has to be strictly adhered to. Every piece of land and every person will have different needs and wishes but using forest gardening principles as a guide when designing a growing space will ensure that a holistic approach is taken resulting in a healthy and sustainable environment. 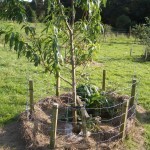 During the design process of a forest garden many of the points that need considering are the same as those for orchards and other edible growing spaces. However with the close interaction between different plants and the wish to create a perennial system that endeavours to keep the soil as undisturbed as possible great care must be taken on the choice of plants and their positioning. Verdant Earth feel that good designs should be about the land as much as the people – forest gardens meet the needs of both.